Ultra chic outdoor seating for your Mexico dream home and your delighted guests. 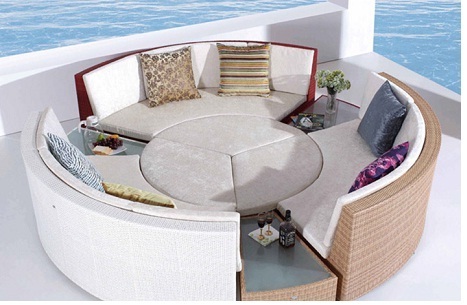 Doesn't this lovely all-weather rattan ensemble seem to have the words "great party" written all over it? Modular design allows you to be creative, flexible and proactive with your guests, setting up any number of different configurations to keep the conversation, the party and the fun going. Arrange the modules and side tables in your favorite manner, perhaps around botanas (Mexican appetizers), perhaps around a fire pit. There's a reason why legendary King Arthur met with his knights at a round table. This all-weather modular invites networking, strengthens friendships and takes connections to the next level. A piece-de-resistance for your Mexican outdoor entertaining spaces. All-weather rattan hand-woven over an aluminum base. 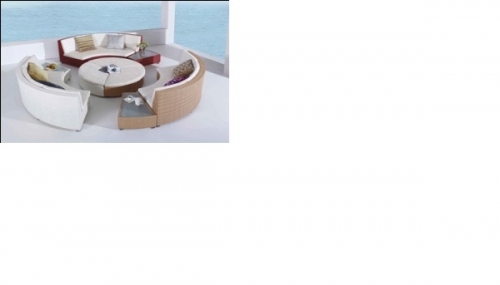 Includes 3 love seat-type seating areas, 3 side tables and 3 ottomans. Please order in advance, as we need at least 8 weeks' lead time on this piece.